On Cartwheel, an art blog based in Los Angeles, Wendy Sherman writes about all the recent exhibits that focus on the history of artists in downtown L.A.
“In Your Face,” sponsored by the District Gallery, is a collection of works by Carlton Davis, Ed Glendenning, Irving Greines, and “Young Turks” filmmakers Stephen Seemayer and Pamela Wilson. The “three movements,” as Sherman calls them, each document an aspect of Downtown history from the Art Dock to Al’s Bar. Sherman goes on to discuss Seemayer’s solo exhibit at the District Gallery, “Signs of the Times,” which continues through May 26. 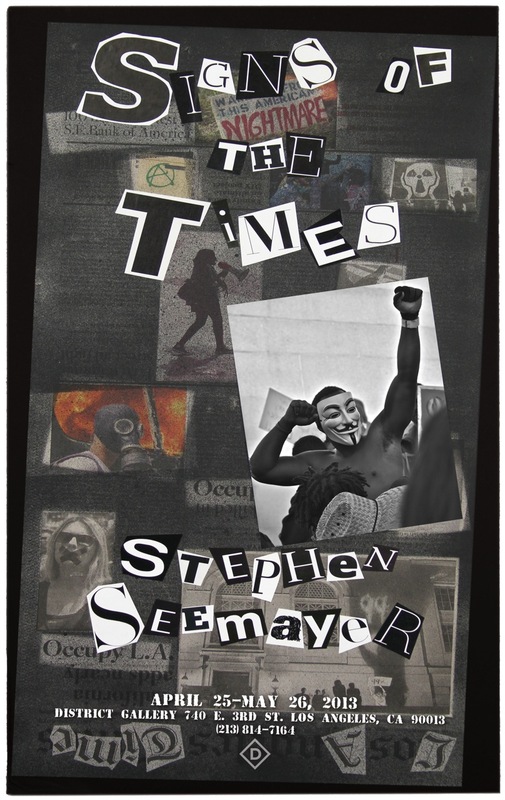 It is a group of pieces inspired by Occupy L.A.
Read Sherman’s full article here. This entry was posted in Press and tagged aerosol, art, arts district, district gallery, downtown l.a., graffiti, los angeles, occupy, occupy l.a., occupy wall street, paint, paintings, seemayer, show, spray paint, stephen, stephen seemayer, young turks by stephenseemayer. Bookmark the permalink. Steve, you are such a good artist, I congratulate your talent, Bravo!